Castor oil packs for womb health are for women who are NOT currently pregnant. Do not use castor oil packs during pregnancy. Castor oil can stimulate the uterus and may induce labour. How is the health of your womb right now? Do you experience painful/irregular/missed/heavy periods? Do you suffer from other more chronic conditions like polycystic ovary syndrome (PCOS) or endometriosis? Unfortunately these conditions seem to be more and more common for many women. Wombs are such an important physical and spiritual part of our beings as women. So why don’t we talk about them more? They do such an amazing job at cleansing our body, at times creating new life, and I believe they also show us some very big signs when our overall health is struggling. When I get talking to women about our precious womb health I find it deeply concerning that so many women experience challenges with their cycle in some way or another. Of course there are many factors that contribute to imbalances and disease in the body, but listening to what is happening in your womb can really pay off. For me this has been a journey of many years of learning to listen deeply and trying different approaches to healing. So let’s get to it – castor oil packs. Using a castor oil pack is an easy and effective method for taking action to encourage self-healing in your womb. Castor oil packs have been used to treat many different types of inflammatory ailments in a variety of different medicinal traditions. In Ayurvedic medicine castor oil packs are used to help move stagnant energy and blood in the womb, and to restore the menstrual cycle to a normal balance (Welch 2011). Castor oil is absorbed through your skin very easily and is effective at reducing inflammation (Kashef 1996). I like to apply a castor oil pack in the evening, when I can leave it on for a while, put my feet up and really relax. I also recommend creating a self care ritual when using a castor oil pack. 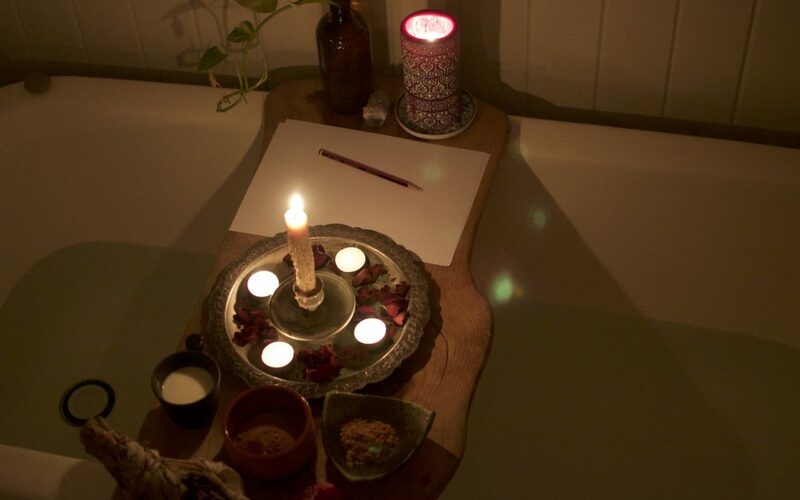 You may like to take a long bath first and using a relaxing blend of rose, frankincense and lavender in an oil burner. This really encourages your mind and body to slow down. You can also use pure essential oils in the castor oil, particularly oils that are anti-inflammatory like Chamomile and Lavender. Massage some warmed castor oil into the abdomen area. Lay down with old towels underneath you. Pour some oil onto the flannel then place onto your womb area (under your belly button down to your pubic bone, and across to your hips). Put the hot water bottle directly over the flannel (you may want to wrap it in an old pillow case so it’s not too hot). Lay down with the pack on for about 90 minutes. I like to take it to bed with me so I can deeply rest and let it work it’s magic. You can use castor oil packs several times a week if you experience severe imbalances in your menstrual health. Do not use castor oil packs while you are menstruating or bleeding at all, or especially while you are pregnant. This is due to the stimulating affect on the uterus which is obviously not helpful during pregnancy. During menstruation it’s best to leave the body alone to do the cleansing it needs to do, and then apply the castor oil packs during the middle phase of your menstrual cycle (around the week before bleeding). You may also notice a heavier or more painful period after using the packs. This is very common and is due to stagnation clearing through the uterus, and should not last longer than one or two cycles (Welch 2011). If you are concerned at all about this consult your health care practitioner. P.S Let me know how this works for you too. Kashef, Z. (1996). Coping with endometriosis. Essence, 26(10), 32. Welch, C Dr. (2011). Balance Your Hormones, Balance Your Life- Achieving Optimal Health and Wellness through Ayurveda, Chinese Medicine, and Western Science. Da Capo Press. For more information about how you can heal menstrual imbalances through diet, lifestyle and stress management (aka learning exquisite self-care!) check out this great book by Dr. Claudia Welch, “Balance Your Hormones, Balance Your Life- Achieving Optimal Health and Wellness through Ayurveda, Chinese Medicine, and Western Science”.